I am full time faculty at Parsons School of Design, a part of the New School. Recently I was awarded a grant called the Faculty Mentoring Fund to bring Alex Joseph to the New School so we could explore the intersections of sound and psychology with faculty and students. The first part of Alex’s visit was a lecture and screening in which he spoke about his background in psychology and the impact that his interest in neurology has on his work as a sound designer. Alex has worked on the sound design of numerous films, notably blockbusters like the James Bond Film Casino Royale, Harry Potter and the Sorcerer’s Stone, and Charlie and the Chocolate Factory. He showed us examples of his work in which he removed all of the dialogue so the audience could grasp just how much sonic effect exists under the spoken soundtrack. Of particular interest was the clips he played from the film Under the Shadow, an Iranian horror film that has no music track and instead relies entirely on a construction of sound effects and sonic atmospheres. In the days that followed we conducted a series of hands on workshops that explored the connections between sound and our senses. Our goal was to expose our audience to some of the content that Alex discussed in his lecture, but for our own purposes we sought to better understand the way that sounds impact different types of stimuli and vice versa. For Alex, this meant developing some possible criteria for his own sound design work, especially his interest in the way that we process stimuli in a VR environment, for me it was to expand my pedagogical tool kit in relation to sound, and also to lay some groundwork for incorporating these strategies into new studio projects. Bitter melon. Excellent rough and nobby texture. Naga-Imo. A hairy root vegetable. Rice sheet noodles. Very slimy. White Gourd Candy. Sweet, but with an unusual texture and hard to place flavor. 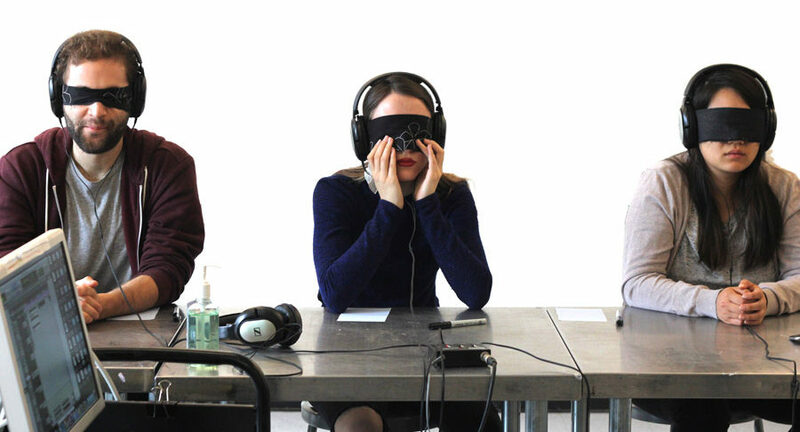 In each workshop we asked our blindfolded participants to become acclimated to a sound played through headphones before they engaged with the secondary stimuli. Here’s are two examples of sonic stimuli. In the first example you will probably need headphones to hear it since the frequency is too low to be recreated by most computer speakers. Alex and I then guided their hand to the stimuli which they then experienced for a minute or two before we silenced the audio. Afterwards, the participants removed their blindfolds to see what they had been touching, smelling, or tasting and then wrote down their observations and experiences. After the experiments we lead the participants through some Foley experiments to experience firsthand the transformation that happen between various object and material manipulations and the sonic effects that can emerge. 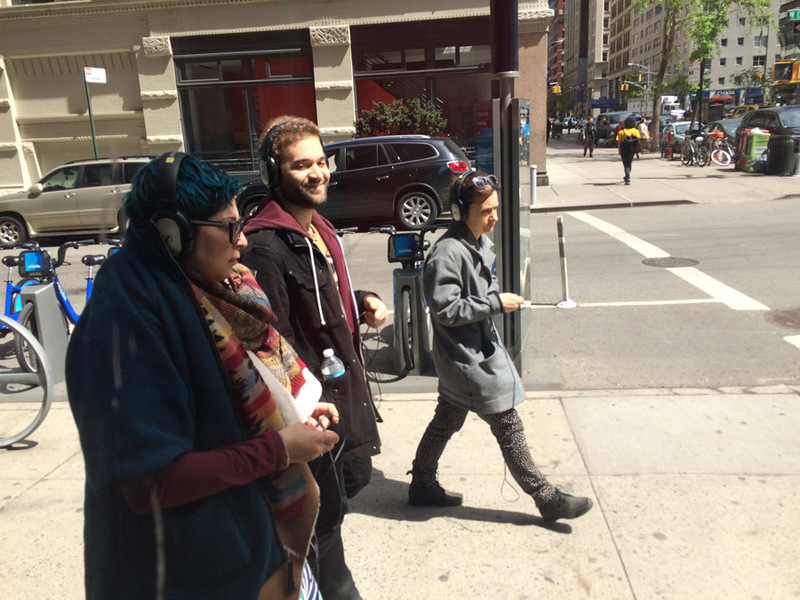 Finally on the last day of Sound and the Mind, Alex prepared a series of soundscapes designed to heighten and/or alter the experience of an auditor as he or she walked through the streets of NYC. These sound collages brought together recordings from other cities, evocations of natural environments, extremely tense battle sounds, various synthesized tones, etc. When the sound walkers returned we asked them to record their thoughts on the experience and then we debriefed as a group. In the sound walk, one common experience for our participants was that they became more aware of visual details that might have otherwise been ignored, for example shadows on the sidewalk, the movement of leaves in the trees, etc. Either consciously or unconsciously they sought visual correspondences for the sounds that they were hearing. In the workshops, we learned what kinds of sounds had the most impact (sweeping tones for example were abstract enough to force a variety of responses, but the darkness or buoyancy of the sound colored associations), which ones directed listeners to particular observations despite the incongruity of the other stimuli (for example the sounds of waves on a seashore lead all participants to construct a rationale for the touch, taste or smell that it was combined with). Cultural connotation had an impact on results and if a participant had a particular association, it helped to drive interpretation.